Colorado governor John Hickenlooper announced Wednesday (Dec. 7) that the state is seeking special status from the federal government that would recognize it as the home of a dedicated commercial spaceport, according to news reports. State officials filed a letter to the Federal Aviation Administration (FAA) requesting that Colorado become a "proposed spaceport state," reported the Denver Post. The designation would enable the state to build facilities to support the country's spaceflight industry, including potential launches within the private sector. As the commercial spaceflight industry picks up steam, spaceports could become important hubs of economic development and growth, first for private cargo or research flights and then eventually as launching grounds for human space tourists, experts say. Colorado has a long history in the aerospace industry, with more than 140 aerospace companies operating facilities in the state, including Boeing, Lockheed Martin, Sierra Nevada and the United Launch Alliance. According to the Colorado Space Coalition, an organization made up of industry officials aiming to promote the state's involvement in aerospace, more than 163,230 people in Colorado are employed in space-related jobs. Hickenlooper's letter also noted that Colorado is among the top three states in the nation to generate the most revenue from the aerospace industry, reported the Denver Post. The mountainous state also has a strong military presence, with Air Force Space Command, Army Space Command, NORAD, USNORTHCOM and three separate Air Force bases headquartered in Colorado. According to the Denver Post, the governor said the Front Range Airport on the northeastern edge of the city of Aurora is a likely candidate location for a spaceport. This airport stretches about 4,000 acres with additional swaths of surrounding land for development, the newspaper reported. 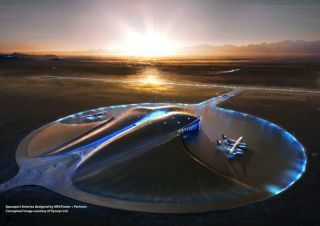 Hickenlooper added that if the request is approved, Colorado's spaceport designation could be ready by the end of 2012. The nation's first dedicated commercial spaceport, called Spaceport America, is located in southern New Mexico. The $212 million facility is being designed as a home base for the budding private spaceflight industry, and is funded by state taxpayers. Commercial spaceship company Virgin Galactic, founded by British billionaire Richard Branson, plans to fly tourist flights aboard the firm's suborbital spaceplane out of Spaceport America.